It envisions battlegrounds of the future, where both technology and tactics have evolved to usher in a new era of combat for the franchise. [Source: Forbes.com] Anyone who thought that the Call of Duty game engine has started to show its age will finally, at long last, be getting a reprieve. The series ran the same (albeit improved) engine throughout the entirety of the Xbox 360/ PS3 generation, and those fans that notice this sort of thing took that as one of the biggest problems with the series — that Activision was essentially re-skinning the same game over and over. Sledgehammer Games’ Call of Duty: Advanced Warfare is the first title in the series built specifically for the Xbox One and PS4, and it’s going to be powered by brand-new tech. It’s good news, especially for anyone who thought Call of Duty: Ghosts didn’t really look like a next-gen game. It’s a new console generation now, and this series will have to fight harder than it has to maintain its position as the most powerful AAA console game. There are a whole lot of PS4s and Xbox Ones out there (more PS4s) — their owners will want to see games that make good use of that new hardware. The engine, hopefully, won’t be the only thing about Call of Duty: Advanced Warfare brings to the table. 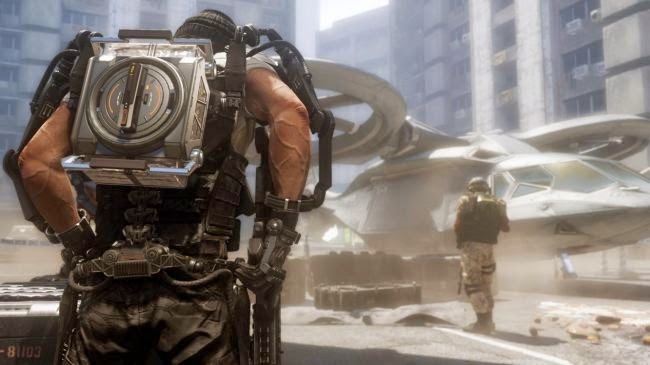 Details are scant so far, but those exoskeletons featured so prominently in the trailer have the potential to change the way players move around the game world, bringing in a little bit of the free-running mobility found in Respawn’s Titanfall. Between super-soldiers, energy weapons and Kevin Spacey, there’s more positive internet buzz for this title than I’ve seen for Call of Duty in a long time, but Sledgehammer has an unenviable task. It has to take the biggest franchise in gaming and establish it as a dominant force in a new console generation — Call of Duty: Modern Warfare served as a clarion call that defined shooters throughout the Xbox 360/PS3 generation, and Activision wants to do it again. One does wonder, however, how the new engine will fare on older consoles — this title might be next-gen first, but it will still be coming out on PS3 and Xbox 360. Call of Duty likes setting records, but Activision won’t be able to do that with the install base on Xbox One and PS4. Pleasing the audiences of those very different machines won’t be easy. Ugh, just let the series ***king die already! Destiny's gonna be way better though.